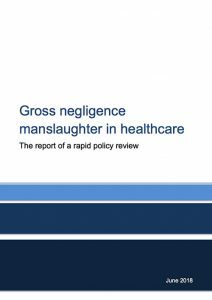 This rapid policy review into gross negligence manslaughter in healthcare was chaired by Professor Sir Norman Williams. The review was set up to look at the wider patient safety impact of concerns among healthcare professionals that simple errors could result in prosecution for gross negligence manslaughter, even if they happen in the context of broader organisation and system failings. Please click here to view the full report.